With the advent of smartphones, it’s become incredibly easy to take pictures of yourself. It’s become such a trend that a name has been affixed to the practice: selfies. Now it’s become even easier to take selfies with the creation of selfie sticks. What is your opinion of them? Selfie sticks are easy enough to understand. 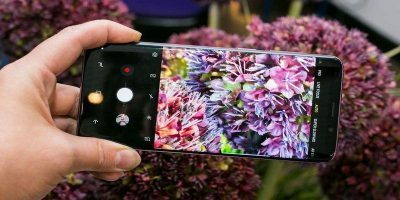 You put your phone on one end of the stick and operate it from the other. It makes it easier to get a proper distance for a selfie as sometimes our arms just don’t seem quite long enough. But always having one at the ready can be a bit of a pain. You’re no longer just carrying around your phone; now you’re carrying around a selfie stick as well. For women, they can just stash them in their purses, but for men, they have to hope they will collapse down small enough to fit them in their pockets. 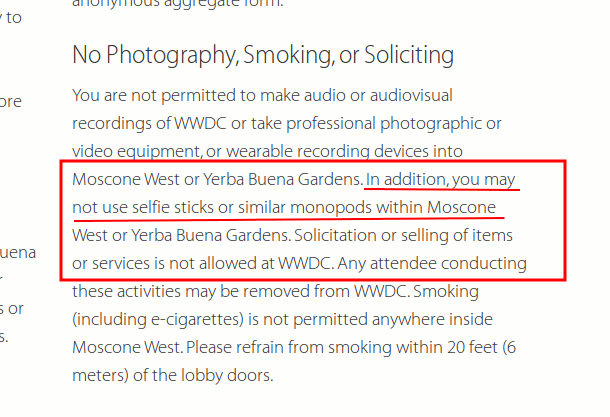 Apple has decided that they are menacing enough that they are now banning them from the WWDC, although they have not committed to a reason. Do you find them to be a menacing accessory like Apple does? Or do you find them to be necessary to take the perfect selfies? What is your opinion of selfie sticks? I don’t understand what the issue is with selfie sticks. If you don’t like it then don’t use it. How are people offended from others using it? Do they create some type of hazard? Do they endanger the public? As a matter of fact selfie sticks can be a hazard. And they do offend people because all of a sudden the person with a stick requires/takes up way more room. Just look at the title photo. The stick places the phone at about 3 feet from the girl. She is in a crowd. What happens if everybody decides to use selfie sticks at the same time? Are we going to have fencing matches with the sticks over who has first dibs on the space? Selfie sticks are for arrogant, self-indulgent twits. My biggest worry about the selfie stick (and I don’t even own a smartphone) is that a neighbor of mine who has a balcony will try to peer over to my apartment using one of these (two windows separate my apartment from his) . . . and I like to walk around my bedroom . . . stark naked doing my workout, seriously speaking. As long as people can be considerate of others I don’t see a problem with them. Just as annoying as someone as someone trying to record whats on the stage with their arms stretched up, all I end up seeing is a sea of glowing screens. How about when a group is taking a group shot and they have someone back up to get everyone in the picture. Everyone else walk around as to not interfere with the picture. I’d think the person taking a picture would take up more room and the selfie stick user could elevate their phone. Being considered goes both ways. My biggest problem is the idiots staring down at their screens as they’re walking. I say if you want to use a selfie stick or whatever to use common sense and respect others, its not hard as I’ve been doing it my whole life and its hasn’t failed me since. Hipsters are mentally preoccopied with their own existance hence they always photographing themselves. Maybe due to lack of breastfeeding when they were babies. I don’t use or own a selfie stick but I am not bothered by it. I see it as another ingenious means of taking a picture with your phone. It does its function well and as a geeky engineer I applaud it. It’s definitely not just for self-indulgent hipsters (heck, most people complaining about selfie sticks ARE HIPSTERS!). This thing shows how are persons: me, me and me!. Why is it OK to have someone waving a stick/phone around my head–or hitting me in the back of my head–but it’s not OK when I swat it to the ground like the big bug that it is? Not being an Apple fanboy, I had to look up that WWDC is the Apple Worldwide Developers Conference. I think a selfie stick is a good solution to a non-problem.